Thousand Smiles is a non-profit organization dedicated to providing free maxillo-facial surgeries and dental work to underprivileged children in Mexico who suffer from facial deformities such as cleft lip and cleft palate. Cleft lip and palate are birth defects that affect the upper lip and the roof of the mouth. Cleft lip and palate can affect the appearance of the face, lead to problems with feeding and speech and lead to ear infections. Teams of dentists, doctors, surgeons, nurses, dental and pre-dental students, and many other countless volunteers from the Rotary club and other organizations come together from the U.S and Mexico four times per year to help these children who would otherwise have no other treatment. As one volunteer stated, this is the “magic” of dentistry. Want to know more about Thousand Smiles? Contact us at mexicomissionsteam@ucsdpds.org OR see our Event Calendar. Norcal Project is a semi-annual trip where a group of dentists from Northern California and a few dentists from Mexico, along with the 49er Rotary club of Nevada, travel to Ensenada, Mexico to provide much needed dental care to the community. It is held at the same clinic as Thousand Smiles but the focus is on general dental care and hygiene, not cleft lip and palate. 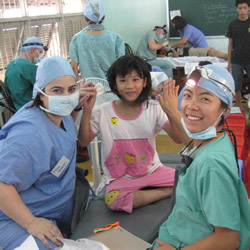 Many of the patients have great dental needs and some have never seen a dentist before. For two days twice per year a team of dentists and volunteers work to offer as much care as they can seeing close to 70 patients or more in a single day. Want to know more about NorCal Project? Contact us at mexicomissionsteam@ucsdpds.org OR see our Event Calendar. Since 2006, our organization has partnered with the U.S. Navy in their humanitarian missions abroad. 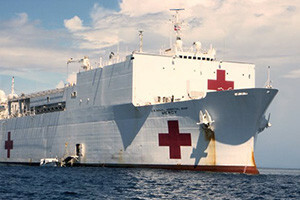 Students and professionals have an opportunity to provide care on floating Navy hospital ships – USNS Mercy and USNS Comfort, as well as the USS Peleliu, USS Byrd, and USS Cleveland Greyhull ships. Countries visited include those in Southeast Asia, the Pacific Islands, the Caribbeans, and Central America. As a large non-governmental organization (NGO) we partner with the US Navy as an integral component of their team. 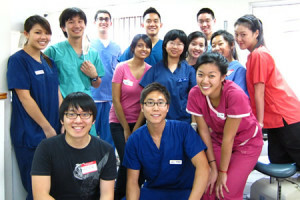 We continuously seek volunteers from the dental, medical, pharmaceutical, and engineering fields, as well as educators and people in the various other health care professions. Come as a civilian volunteer to change lives! If you have any questions, you may contact us at missionsteam@ucsdpds.org OR see our Event Calendar. 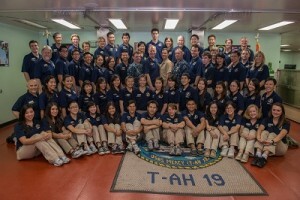 Are you interested in joining future Navy Missions? To learn more about future Humanitarian Missions, please email us at missionsteam@ucsdpds.org and ask to be added to our Missions listserv. You will receive our latest announcements about all of our missions! Check out past mission videos in our Media Center!